In the past, we’ve done some looking into custom ROMS and their benefits. However, it’s easy to get lost in the amount of information out there. With this article, we hope to answer the following questions: Why would I ever want to install a custom ROM and which ROM is suitable for whom? First, it must be clarified as to why you should for a custom ROM. 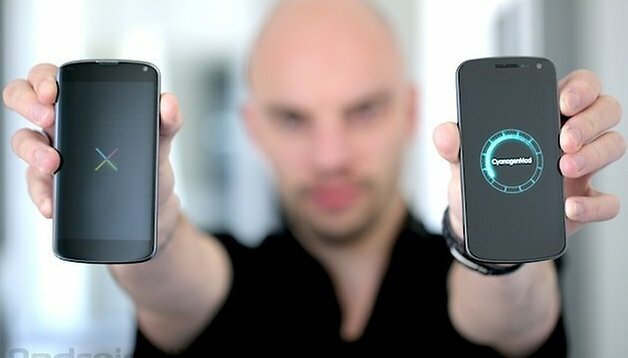 One thing is certain: not every user who owns a smartphone or Android device needs a custom ROM, but it’s still worthwhile to learn about what the Community can do with custom firmware. As such, I see three useful applications for custom ROMs. Many users are familiar with this problem: Your smartphone is only a year old, but the manufacturer has decided not to provide any more updates. New versions of Android are not only interesting because they bring new features, but they also include security updates. Custom ROMs brings not only the latest version of Android to your device, but they also provide a plethora of customization options. Whether they are themes, additional options, or overclocking, the possibilities of custom ROMs are almost unlimited. You may have bought your phone because you find that the hardware and the design were particularly appealing, but you’re also a fan of pure Android. Many users find manufacturer ROMs, such as Touchwiz and Sense, to be clunky and unappealing. The basis for custom ROMs is the “Android Open Source Project”, or AOSP for short. All ROMs are based on a genuine version of Android, which are subsequently enriched by the community behind firmware modifications. Custom ROMs are a dime a dozen and they aren’t always easy to choose from, especially when looking for one that suits your personal needs. CyanogenMod is without a doubt one of the most popular custom ROMs out there and it’s pretty easy to see why. It’s fast, stable, and offers many customization options. The settings are specified clearly and aren’t too ridiculous, enabling beginners to the custom ROM scene to not feel overwhelmed with an abundance of options. CyanogenMod is also great for everyday use. For those that are constantly changing the look of your ROM and want to be able to control everything down to the smallest detail, the AOKP custom ROM is definitely the choice for you. The setting options for the ROM are virtually unlimited and you can tweak almost everything within it: from the position of the clock on your screen to the colors of almost anything. Do you have a smartphone but want the tablet look? Check out Paranoid Android as it offers you the option to change the layout of Android apps to be optimized for either a tablet setting or a smartphone setting. In addition, there are a ton of other additional settings that you can play around with, such as the transparency of the status bar. Do you want to try something completely different from the standard Android experience? Check out MIUI as your custom ROM of choice. The appearance is that of iOS and uses large icons, a glossy look, and a lot of eye-candy. Definitely not one if you’re looking for something simple, but who knows, it may just catch your eye. Of course, this was only a small sampling of some of the custom ROMs that are available. Like I said, custom ROMs are a dime a dozen and more keep on popping up every other day. For those who just don’t like the idea of rooting their device and installing a custom ROM, you can always check out the countless number of Android Launchers that allow at least some flexibility when it comes to personalization. What’s your favorite custom ROM? My S3 with Omnirom V5- 4.4.4 KK on it is great. I haven't seen much extra with Lollipop5, so will probably leave it as it is. No sammyjunk means that it works a lot better, and is definitely quicker. I have A1 type keyboard on it too, cos I find it easier to punch in passwords with the number row at top, rather than keep touching the bottom left key. The S4 and Note 4 have a number row, why don't ALL phones. Anytime CJ! These are the more interesting ones to write up as I always find I learn something myself when doing the research. Great article (thank you for posting)!